Prime Minister Theresa May has told Cabinet that she is ready to reopen the Withdrawal Agreement to seek legally-binding changes to the backstop, in the hope of winning the support of Parliament for her Brexit deal. Mrs May told the weekly meeting of senior ministers in Downing Street that she will open this afternoon's Brexit debate in the Commons with a statement explaining why she is backing Sir Graham Brady's amendment as a means to achieving this goal. Her official spokesman said she aims to return to the Commons "as soon as possible" with a revised deal which will be subject to a "meaningful vote" by MPs. If this is rejected by MPs, she will table a further amendable motion for debate the next day. If no new deal has been reached with the EU by February 13, Mrs May will make a statement to the House that day and table an amendable motion for debate the following day. European Commission spokesman Margaritis Schinas said Brussels was waiting to see what happened in Parliament. "This is not a Brussels day, this is a London day. We have the vote tonight and then we will take it from there," he said. Mr Schinas added: "What we have on the table is the Withdrawal Agreement, we have a Political Declaration. The agreement has been adopted by the 27, accepted by the UK Government, we have the joint letter between (Donald) Tusk and (Jean-Claude) Juncker providing more in-depth background information. "There is nothing new on the table so don't look to Brussels on this, look to London." He said that European Commission president Mr Juncker was "permanently available and in permanent contact" if Theresa May wanted to get in touch. 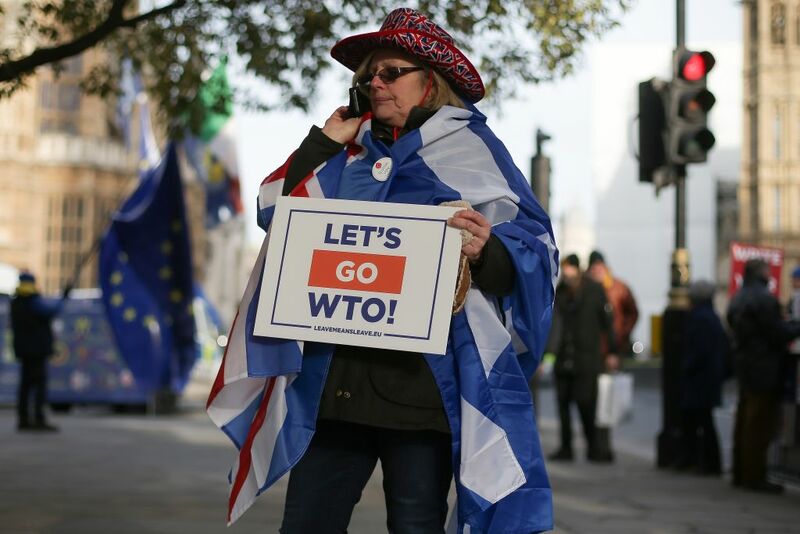 A pro-Brexit protesters outside of the Houses of Parliament in Westminster, London. International Trade Secretary Liam Fox said support for Sir Graham Brady's amendment would enable Theresa May to return to Brussels with a "strong mandate" to seek changes to the Northern Ireland backstop. He said the Prime Minister was prepared, if necessary, to reopen the Withdrawal Agreement in order to secure a legally-binding text. "I think we should send the Prime Minister back to Brussels with a strong mandate to be able to say 'If you compromise with us on this one issue, on the the backstop, we would be able to a get an agreement' - an agreement that is almost there," he told BBC Radio 4's Today programme. Mr Fox said he believed attitudes on the EU side towards a new compromise were changing. "We have seen the German economy weakening, we have seen the French economy weakening," he said. "I think this view - 'We can simply weather out any disturbance that would occur from a no-deal' - I think there is much less appetite for that. I think we still have time to reach a compromise on that."